US #4225 from the 2008 American Scientists set. Click image to order. 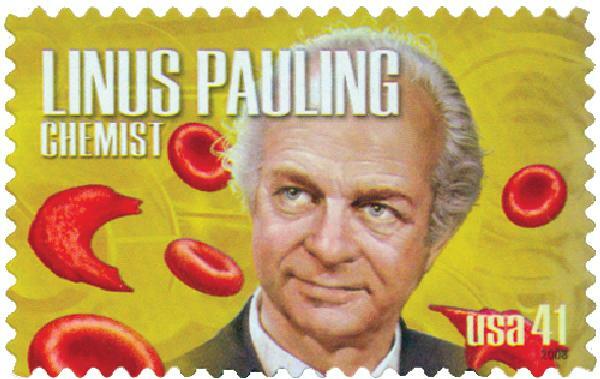 American scientist Linus Pauling was born on February 28, 1901, in Portland, Oregon. US #1773 was issued on Steinbeck’s 77th birthday. Click image to order. 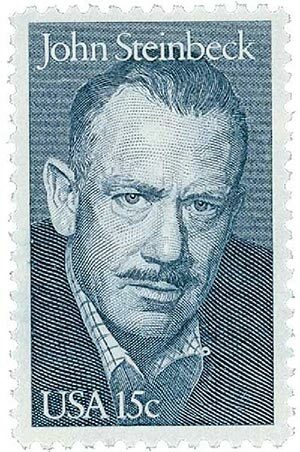 On February 27, 1979, the USPS issued the first stamp in the Literary Arts Series honoring author John Steinbeck. Leading up to 1979, the USPS began considering a new stamp series to honor American writers. After receiving over 1,500 suggestions, they selected John Steinbeck to be the first honoree in what would become a long-running series. 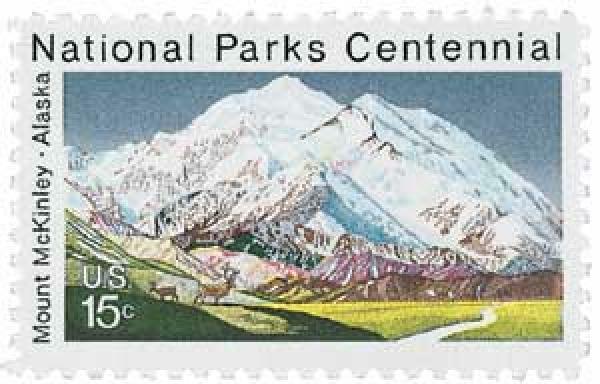 US #1454 was issued for the 100th anniversary of the first US national park. Click image to order. The area of the present-day park was hardly habitable 11,000 years ago when bands of Native Americans began to occupy surrounding areas. Tribes including the Koyukon, Dena’ina, Ahtna, Kolchan, Tanana, and Athabaskan were among the earliest and most common. The first people likely entered the park about 7,000 years ago, and the first occupied it seasonally about 5,500 years ago. Harsh winters, frigid winds, and few trees made it difficult for people to survive there during the cold months. US #1805-06 were issued on this day in 1980. Click image to order. On February 25, 1980, the USPS issued a set of stamps commemorating National Letter Writing Week. Those stamps marked the first time that the USPS issued a sheet of stamps with three sets of vertical pairs. In 1980, National Letter Writing Week ran from February 24 through March 1. It was the first time the US observed Letter Writing Week in 15 years. But they invested a great deal of time and effort into promoting it. US #651 was issued for the 150th anniversary of this victory. Click image to order. 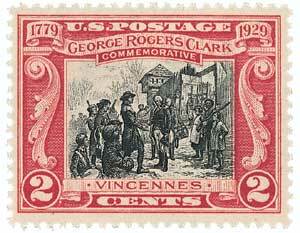 On February 24, 1779, George Rogers Clark led a siege of Vincennes, forcing the British to surrender. After the French and Indian War, the British occupied the majority of the trans-Appalachian frontier. They soon passed the Proclamation of 1763, making the settlement of land west of the Appalachian Mountains illegal for colonists. The British responded harshly to settlers who ignored this decree, sending Native American war parties after trespassers. 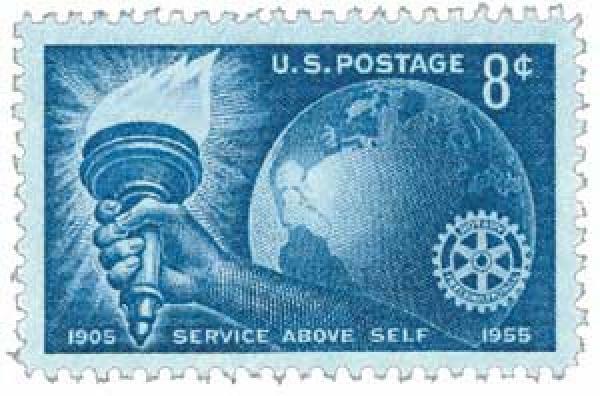 US #1066 was issued on the Rotary Club’s 50th anniversary. Click image to order. On February 23, 1905, the Rotary Club was founded in Chicago, Illinois. The Rotary Club was founded at the request of attorney Paul P. Harris. He invited two business acquaintances – coal merchant Silvester Schiele and tailor Hiram E. Shorey to meet him in the office of Gustave Loehr, a mining engineer and freemason.